I've missed y'all the past couple of days! This week started out a lot busier than I had anticipated but here we are half way through and I am still making it! I'd say we may be doing even better than just making it because I am sharing a post I get requests for year after year and the creation of it this year has by far been my favorite. I've become oddly obsessed with photography and lightroom lately so hopefully the images make it seem as though that obsession hasn't gone without at least semi tangible results! 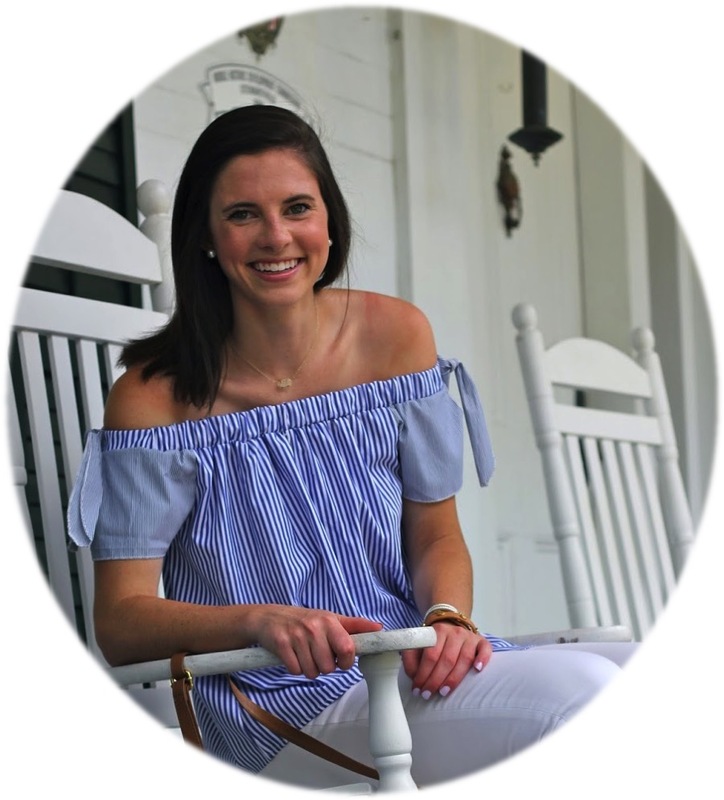 If you've been following along for a while then I am nearly positive you know my intense love of organization, paper goods, and most importantly my planner. 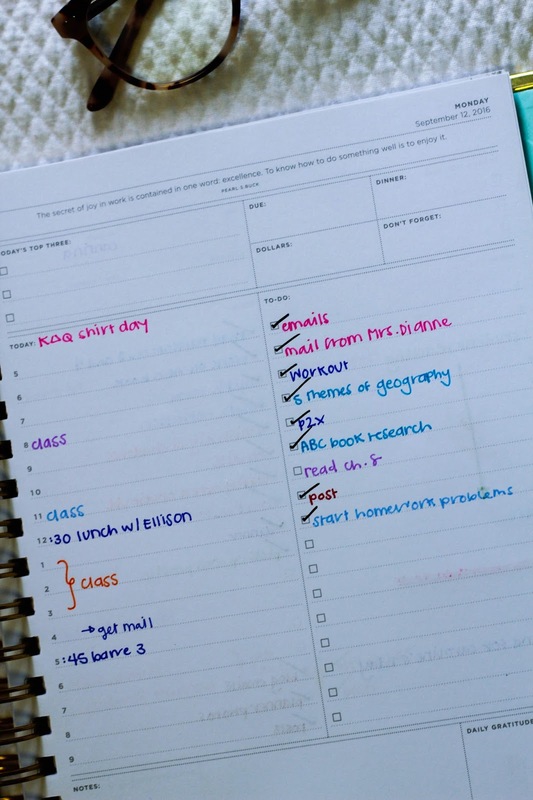 I seriously geek out over these things (talking about you school supplies...) and LOVE seeing how other people organize theirs so I am happy to share the method behind my madness with each of you with hopes of helping you to better manage your busy schedule in a way that makes sense to you. 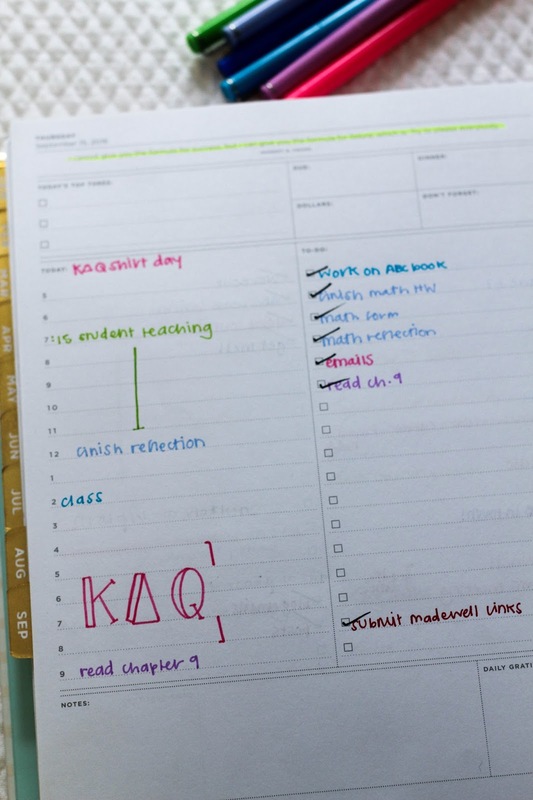 It wouldn't be right to start this post out with anything aside from an ode to my planner since I'm not sure I would've made it through junior year of college let alone my 8:30 this morning without it. If coffee and my Day Designer were in an argument over which is more vital to my daily functioning I think my Day Designer would still win and that's saying something about my coffee-dependent self. 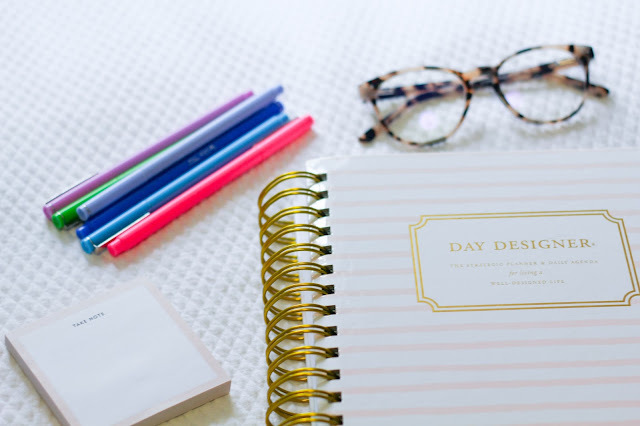 I started using my Day Designer last January and am fully convinced that I'll never have to hunt for a perfect planner ever again because this one does it for me. I talk about it so much that I have essentially forced friends into getting it so that I'll finally stop raving about it to them but now our discussions are about how obsessed we both are. Since I consider us friends I will treat y'all the same way. 1. It's aesthetically pleasing yet simplistic making the pages very functional. 2. 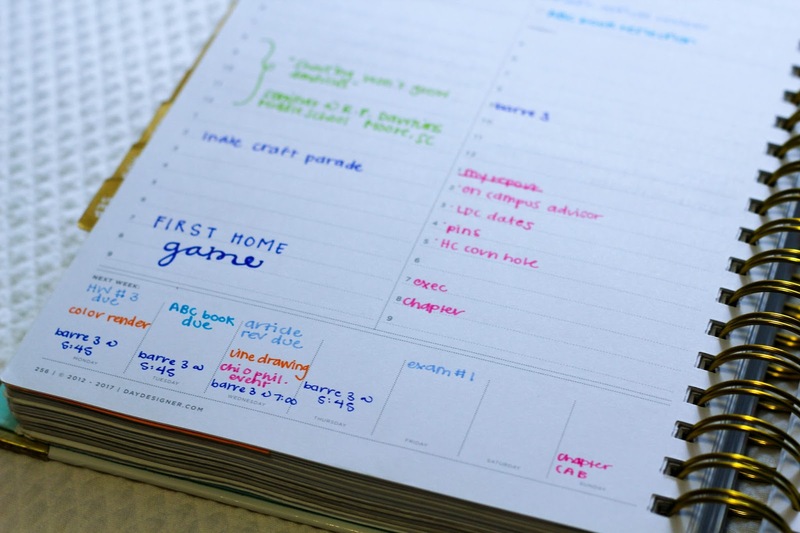 You have a page for each day of the week complete with time slots, a to-do list, and a place for additional notes. 3. It's perfect for college students or adults because you are able to fill it to fit your needs. 4. The lining is light blue and never fails to make me smile when I open it. 5. I never run out of space to write down even the busiest days. 6. The monthly calendar boxes are plenty roomy and look so pretty all color coordinated. 7. It's sturdy and still looks great after carrying it essentially everywhere and shoving it in my backpack multiple times each day. 8. There is a whole section at the beginning of it just for goal setting. 9. 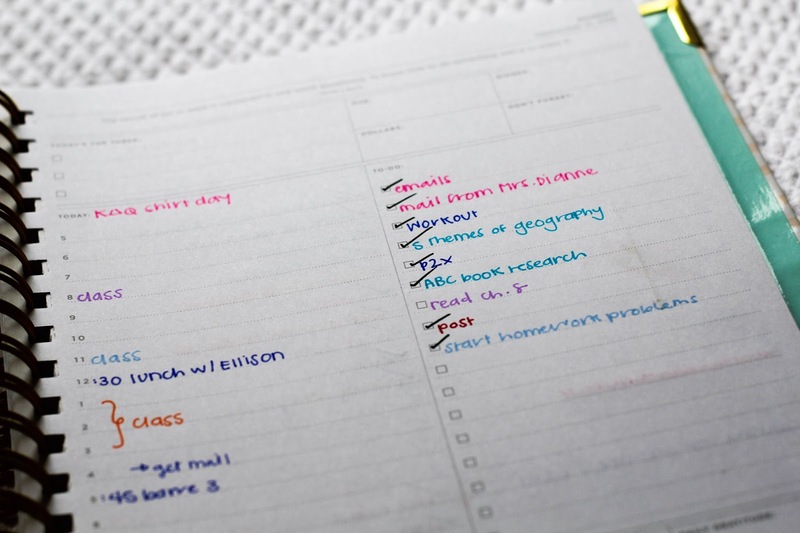 You get endless satisfaction from checking off something on your to-do list. 10. It definitely keeps me sane and is a whole lot cheaper than a therapist would cost after constantly being overwhelmed trying to think about what you may have going on next. I honestly can't recommend it enough and love taking a bit of time each morning to completely plan out what I have going on during a given day while also writing down the tasks I need to accomplish. For those of you concerned by the amount of space it may take up since there is a page per day I would say do not worry about that considering mine slides perfectly into the front pocket of my backpack without sacrificing any other space. 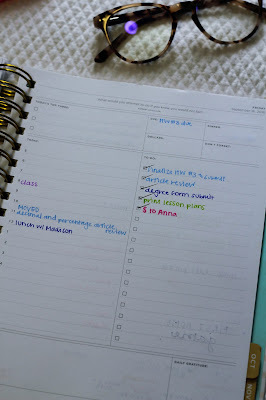 I have always been a huge fan of color coordinating my agendas and I knew that I wanted to do that with my Day Designer as well. I swear by Le Pens and have used the same ones for about 3 years now (worth the investment!) and the best part is that in addition to writing really smoothly they don't bleed through the pages! 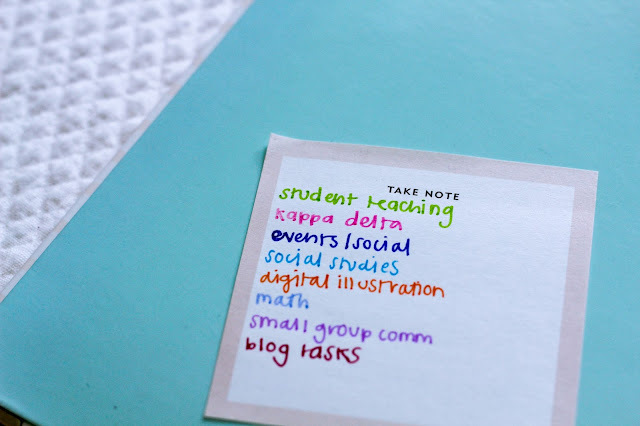 At the start of each semester I take a post-it note and assign each class and activity a different color pen! 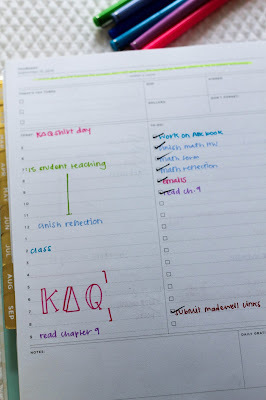 For reference: Pink - Kappa Delta // Orange - Digital Illustration // Royal Blue - Events/ Social // Green - Student Teaching // Light Blue - MTH 302 // Turquoise - EDU 332 // Purple - COM 111 // Red - Blog Tasks. 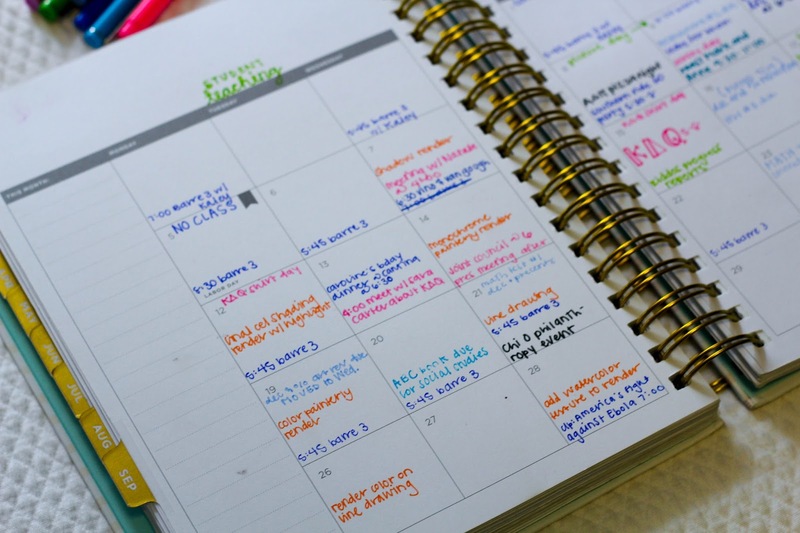 I use this color coating both on the daily pages and on the calendar overview. After a week or two I automatically start associating each color with its class and don't even have to reference the post-it note. 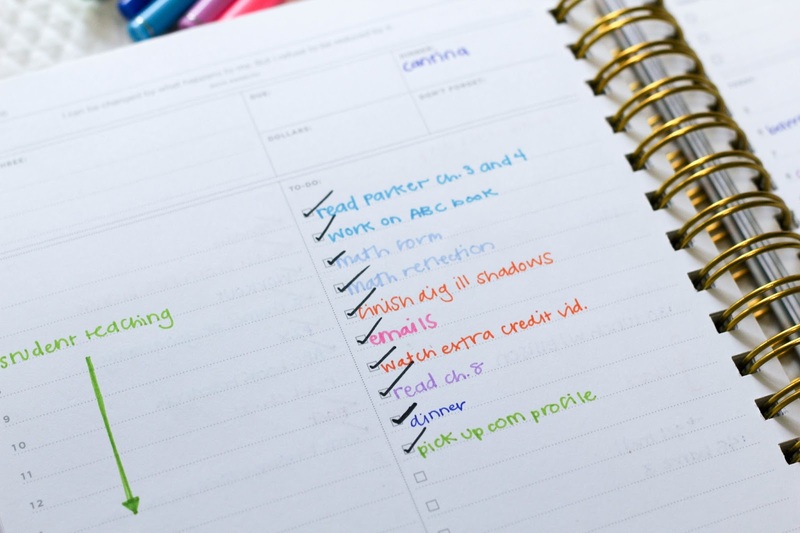 The daily pages are set up in a really user friendly way with lines to fill in what you are doing during specific times of the day from 5 am to 9 pm on the left hand side and check boxes for your ever growing to do list on the right side of the page. 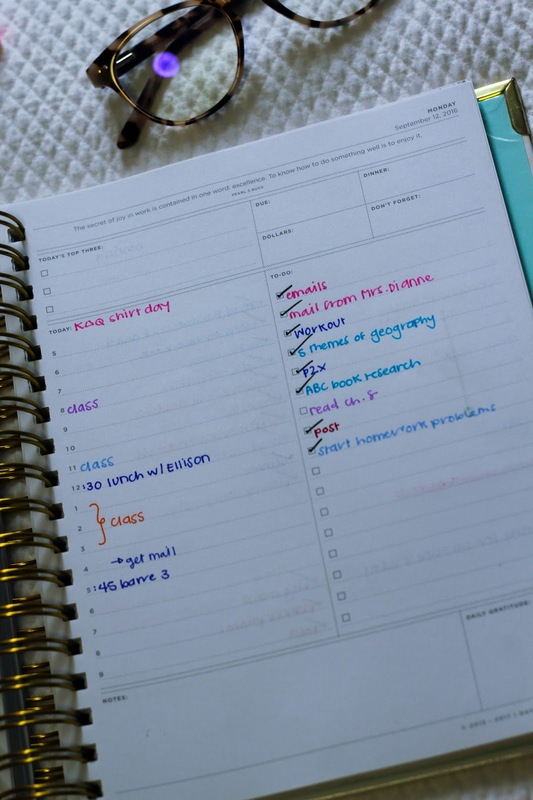 Above those are a place to write down your top three things to do on a given day, what you have due, dinner plans, and a don't forget section. While I don't always utilize each of those boxes it is nice to have them on especially busy days! Also at the top of each page is a quote and as silly as it sounds I love flipping the page to see which quote will be next! When filling out the hourly lines I like to write in generally what I'll be doing at that given time whether it be class, the library, laundry, meetings, or even the errands I need to run. If I have a test or big assignment due in a given class I also include that in the hourly section just as an extra reminder! The to-do list section is definitely what I utilize best as I write down just about everything I need to accomplish. In my opinion with organizing an agenda there is nothing more satisfying than crossing off something on your to-do list! 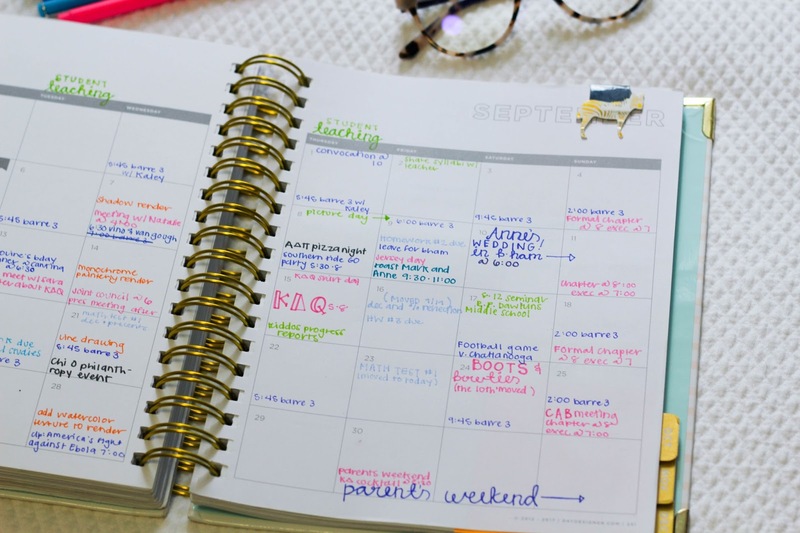 For the weekends the agenda is organized so that both weekend days are on the same page which is useful since I usually have less going on on Saturday and Sunday than I do during the rest of the week! I don't typically actually use the hour times on these pages and instead write down generally what I need to get done over the weekend. My favorite part of the weekend pages are the overview boxes at the bottom of the page to fill in what all I have going on the following week. 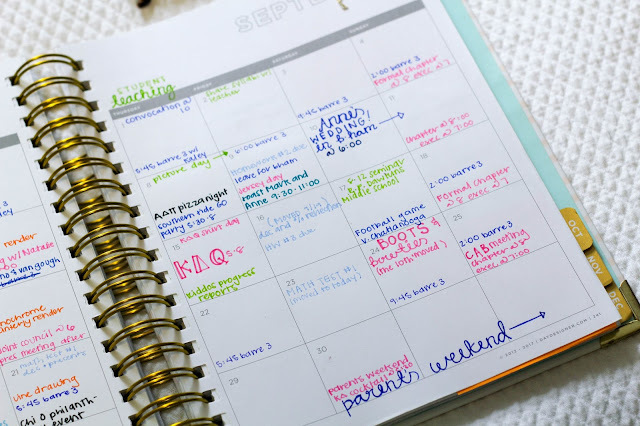 This is a great way for me to get an idea of how hectic my next week will be before the weekend is over so that I can prepare accordingly! 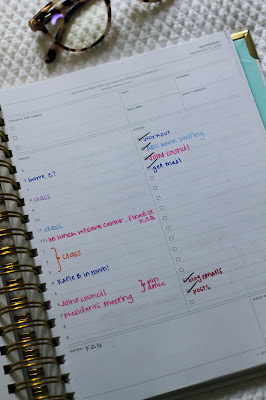 I keep this part color coordinated as well and try my best to include meetings, assignments, and tests as well as any other exciting events for the week to come. 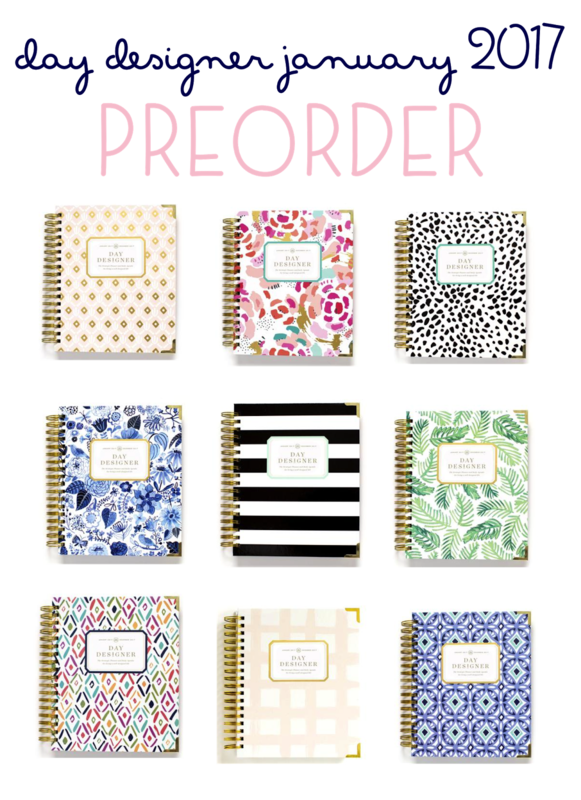 The Day Designer is released a few times each year when you can go ahead and pre-purchase yours for the academic school year or yearly and the yearly release for the planners you can start using in January of 2017 just recently were released. Since I'd be heartbroken if they were to sell out before I ordered my preferred cover design I thought I'd share that little fact with y'all (and they really do sell out). Here are the covers offered for Jan 2017 - December 2017. Can y'all guess which one I am ordering? 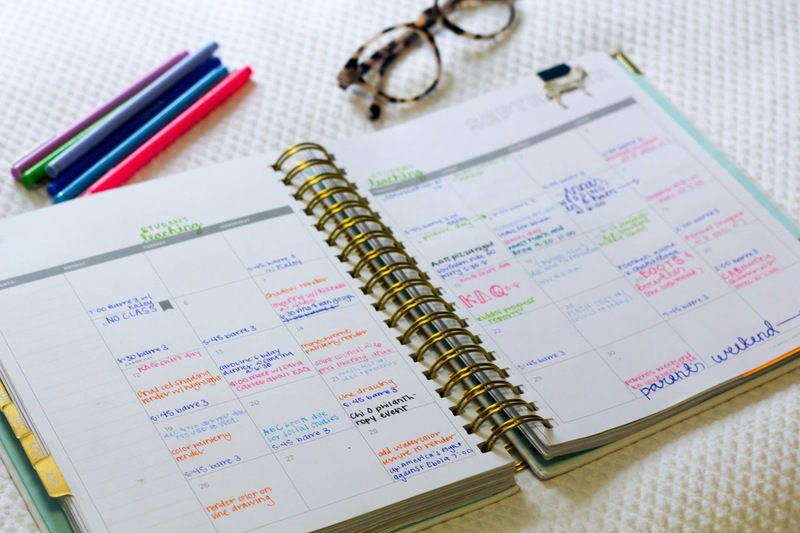 I'd love to hear your planner organization methods and if you're as methodical about the process as I am! Happy Hump Day! 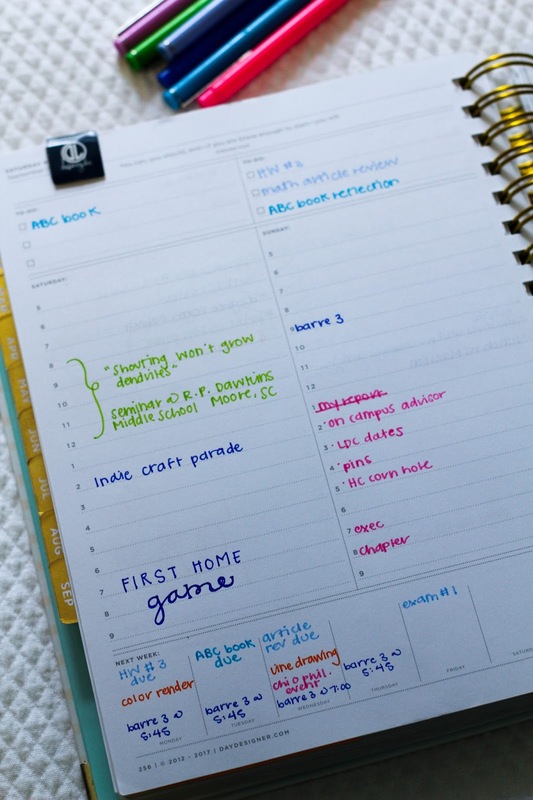 I love getting a peak into other people's planner! 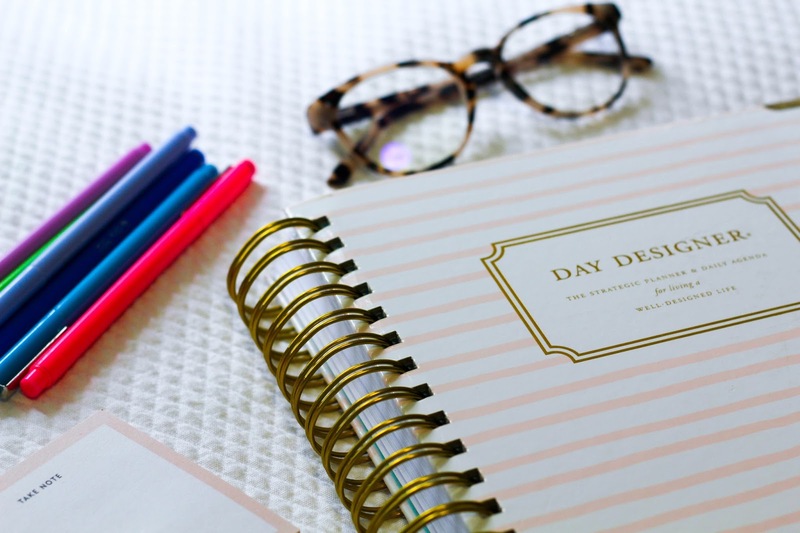 I recently picked up the day designer collection when she partnered with target, so it's a cheaper, less intense version of this planner. I use it in conjunction with my two erin condrens and love it! Are you getting the blue and white floral or blue and white kaleidoscope? ;) I've been using a Simplified Planner this year, but I'm loving the look of the palm print version of the Day Designer. 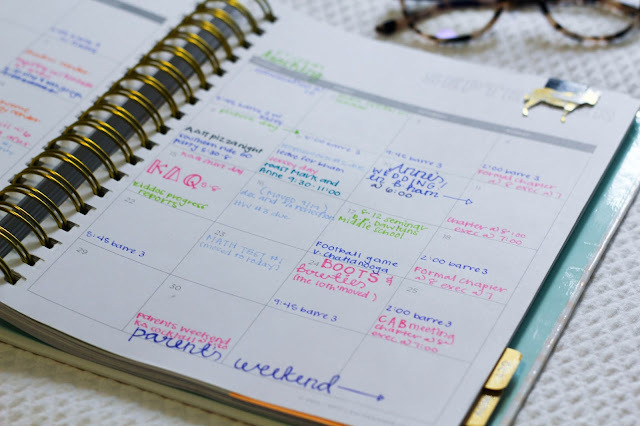 I love seeing how you organize your Day Designer, I have been loving mine! I don't ever use the monthly view so I especially loved seeing how you used that! I love my Day Designer. Color coding is super helpful. I started color coding after seeing your color coding on your Lily Pulitzer agenda. Just ordered my 2017 Day Designer! Thanks for the great review! !